In Chinese astrology, the Dog represents the most friendly, easygoing, considerate and loyal of personalities. People born in the Year of the Dog are assumed to gain some of these nice, reliable and straightforward qualities within their personality. Western astrologists generally depict a Sagittarian as honest, optimistic and adaptable. All these uncomplicated and pleasant character traits are thought to be bestowed on a Sagittarian Dog individual. They are usually affable, complacent, understanding and positive in their demeanor. The Sagittarian Dog is easy to get to know, as he is quite informal in the majority of their mannerisms. The Sagittarian Dog possesses lots of charm alongside their forthrightness and informality. So, they are easily approachable and extremely easy to talk to, and there are not many people they cannot get along with. Their casual openness is often a refreshing change in a person, and one that gets them respect. 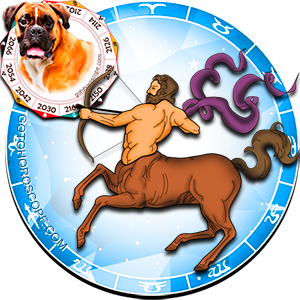 Everyone who comes into contact with a Sagittarian Dog is treated to someone who expresses themselves well. There are usually no hidden extras aside from what you actually see with these particular personalities. They show their emotions freely, so their moods can more often than not be predicted. Sagittarian Dogs are flexible and versatile, so they are happy to work in most environments doing anything, from simple to complex. They enjoy working with others, and are not inclined to take jobs with solitary responsibilities. They are hardworking and will always do their fair share. After work the Sagittarian Dog likes to usually just go straight home, but they can be occasionally persuaded to have a night out with friends. They are homely people who appreciate the comfort of familiarity, and greatly value their family. These individuals love to be surrounded by those they love and tend to never settle far from their childhood roots. Personal relationships with a Sagittarian Dog are usually harmonious, due to the way they are so respectful of others. With their easy-to-read emotions, they can quickly convey calm onto situations. They will never antagonize partners into disagreements, and if one occurs they are able to negotiate and compromise fairly. The Sagittarian Dog prefers a quiet, peaceful, and very close, emotionally deep relationship with a soulmate. They are a little jealous-natured and possessive with partners, but these are not extreme occurrences, and soon pass. These Sagittarians are usually devoted and faithful, demonstrative, attentive and thoughtful. Being so laid-back can have its disadvantages as well as its advantages for the Sagittarian Dog personality. Sometimes it can be a weakness, as it can mean that they can underachieve in life. They will often not have any real aims or goals, being happy to just blend in and accept the hand that life deals them. They may need encouragement to realize their potential and aim a little higher. This is a lack of confidence weakness, but it can be overridden and is not frequently a major issue for most of these Sagittarian Dogs. As they get older they seem to get more confident. "they are homely people?" Homely means ugly! I guess this author was trying to say they love to be at home.Ha ha! For shiva I would say you are attracted to the strong characters that like to see things happening. That's why you were with both dig and dragon.. Try Gemini , dragon ir tiger .. I'm a Sagittarian Rabbit who has been married to an Aquarian Dragon and a Capricorn Dog. I only heard about ccombinatorial astrology recently. What would be a good match for me. Hey Pasadaniya, I'm curious what ways you think are not true because there is some parts that I also didn't agree with and seemed very different from my personality. don't leave us hanging on curiously n suspense you left us in and elaborate please and thanks! !